Thanks to Blizzard's current sale on World of Warcraft, it's going to be tough to stay away from the Cataclysm. 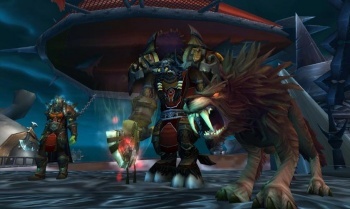 With World of Warcraft: Cataclysm set to significantly change the entire game as it's been known for the past six years, many gamers are likely still trying to decide if they should either check the game out for the first time, or make a triumphant return to Azeroth. Blizzard is making that decision easy for them, as it's selling every World of Warcraft product it has for extremely cheap on the Blizzard Store. A limited time sale has knocked at much as 83% off of the retail price of World of Warcraft and its expansions. The original game is going for just $5, as is its first expansion Burning Crusade which raised the level cap to 70, opened up Outland, and made greens as good as purples for the first time. Wrath of the Lich King, World of Warcraft's second expansion, is selling for 75% off at just $10. Lich King raised the level cap to 80, added the Death Knight class, and sent players into Northrend where their once awesome flying mounts were grounded by frost. If you've been on the fence about trying World of Warcraft, $20 is a damn good deal to get up to speed, aside from December 7th's Cataclysm expansion of course. If you want that too, it'll still run you $39.99, though buying a digital copy from Blizzard will be the quickest way to play. The sale is available from the Blizzard Store here.